My second visit to the Studio in Shirley found me in festive mode, again welcomed and made to feel very comfortable by this theatre-passionate group. 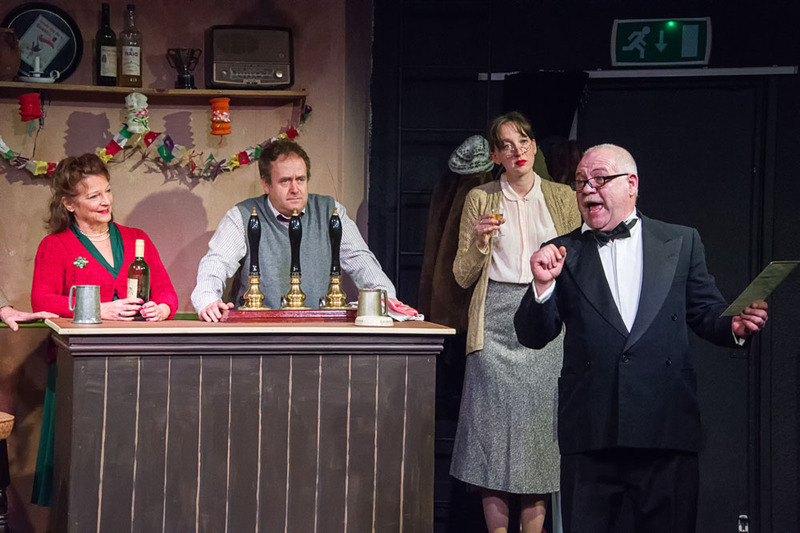 The premise for the evening is a Southampton pub in 1940s Britain, when circumstances allow for various characters to find themselves available for a ‘turn’ at Christmas. Local references grounded the piece, with an ENSA troop being stranded outside and asking for refuge and room at the inn, their trip to RAF Stoney Cross being curtailed due to transport difficulties. 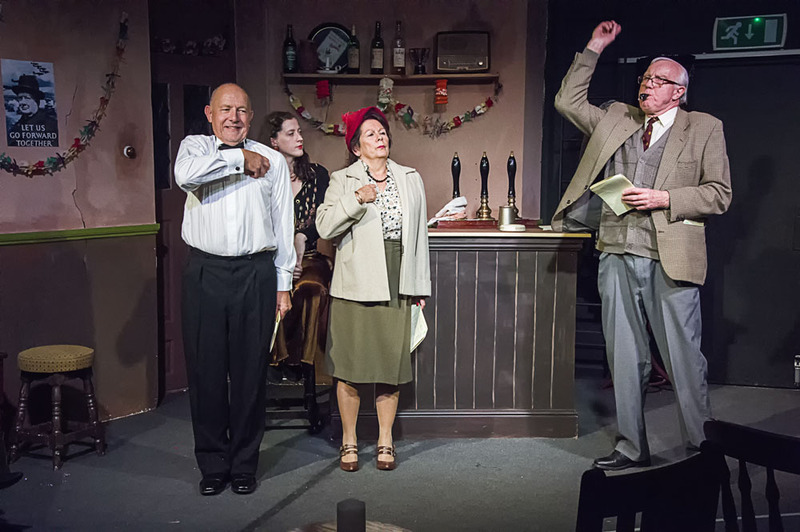 The first act was punctuated by character introductions and scenarios which, for me, distracted somewhat from the quality readings and songs that were performed by a very talented cast. We learnt about the characters and where they came from, but were not given the time to elaborate, establish relationships with or create empathy for them. This, along with ad hoc ad-libs etc, left the son’s revelation in act 2 a tad redundant and a little emotionally flat. Use of prompt cards referred to as scripts were not really needed, as the cast were more than proficient without them. Not that the sold-out audience around me seemed to mind at all, such was the enthusiasm of the reception given to all that was put before them. The performers’ efforts deserved such a response. Act 2 worked far better as it had less linkage material and it allowed the continued well-selected items to speak for themselves. The opening re-creation of the ‘Silent night’ World War 1 trench experience was atmospherically stunning (it did not need the character asides or the introduction, such was its power). 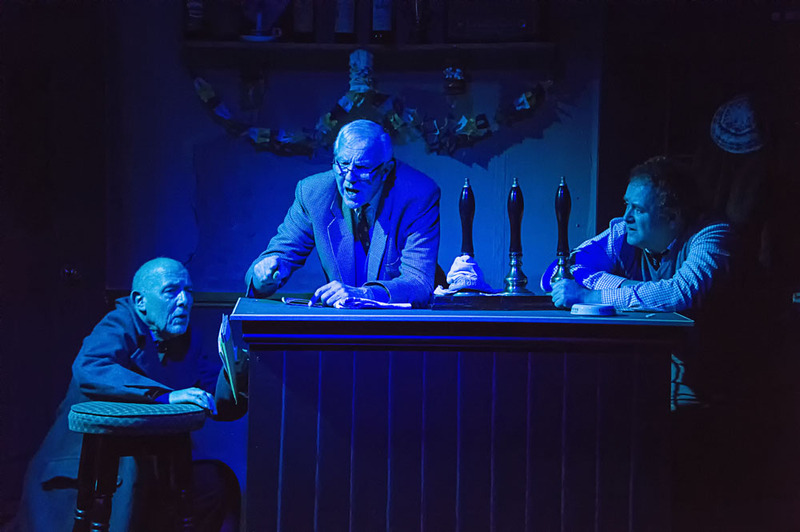 The bar area doubled as the trench and the lighting was immaculately done: the gentlemen were lit in a silver blue as there emerged from the fog one German voice singing the classic song. This segment will stay with me for some time. 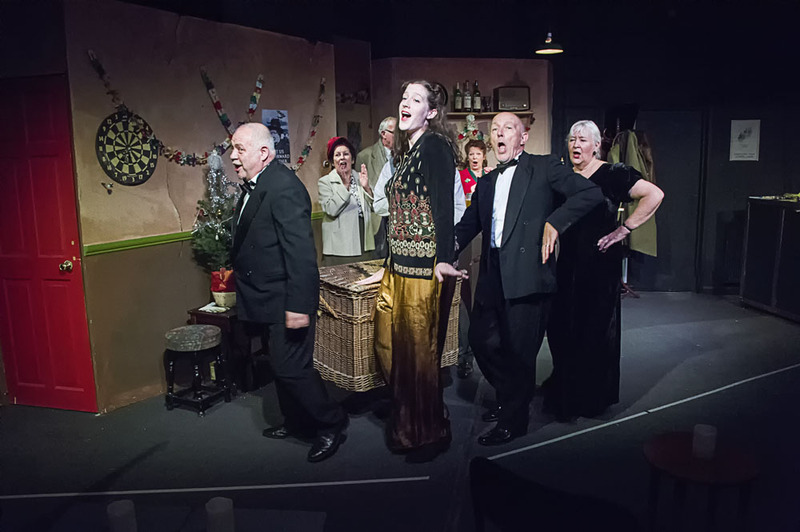 The ‘Father Christmas on the cake’ and the ‘Innocents’ song’ were highlights amongst a programme of highlights, with all the cast being allowed to shine throughout the evening. It was a lovely touch to provide appropriate eatings and drinkings as part of the ticket price. Overall, a quality Xmas treat to distract from the wrapping paper and tinsel: you will find a meaning of Christmas here. Sheana Carrington and Brian Stansbidge have had a splendid idea for a Christmas show. For details, see the lovely and interesting programme. The story is set at 'The Star Inn' in 1940, six months into the Southampton blitz, regularson Christmas night. 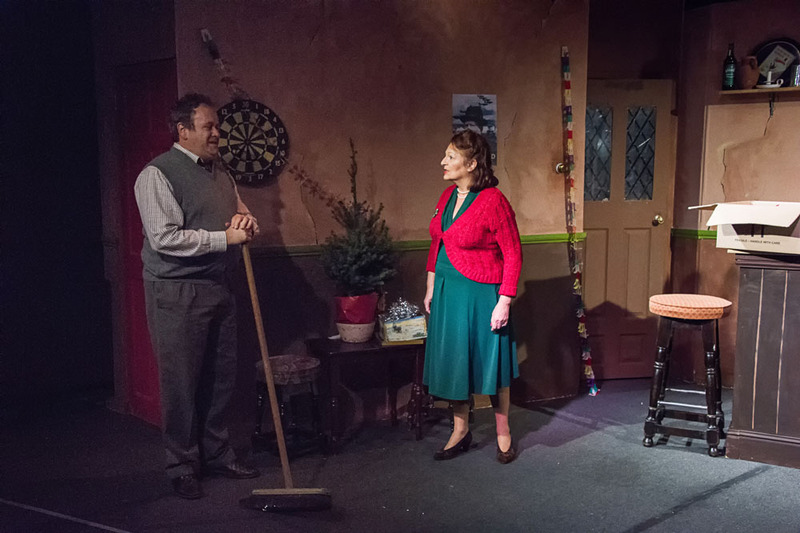 Jack the landlord (Johnny Carrington's displays of silent reluctance to be lumbered are beautifully timed and most amusing) is persuaded by barmaid Phyllis (played by Angela Stansbridge, but based on a historical character! Do any readers remember the barmaid at 'The Rover'?) to squeeze in a stranded 'company of players', "for one night only". 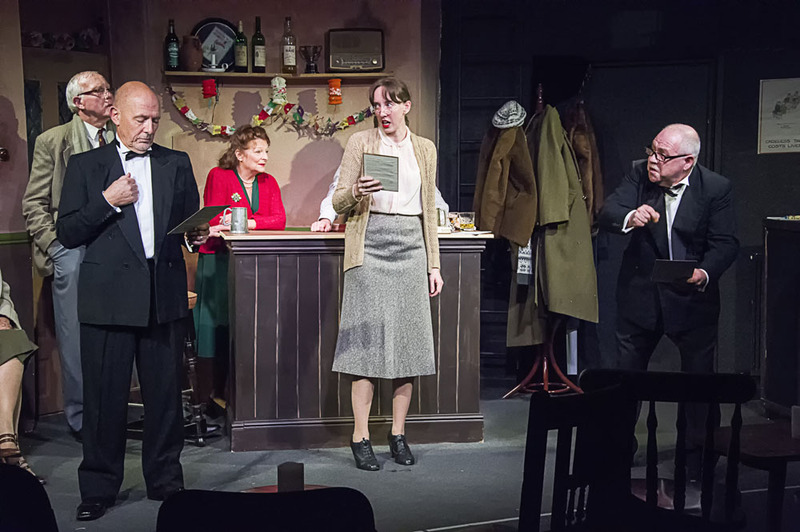 Christmas, the war, the gathered players naturally lead to a show packed with honest sentiment, favourite songs, poems and party pieces. And not just the players, but stalwart regulars reveal unexpected performing talent. The seating was arranged around small tables, which seemed to give more legroom without, I was assured, affecting the number of seats available. Be prepared for this years Christmas Anthology with a difference.............. It is December in 1940, we are in the local pub and the owner and staff are feeling pretty miserable what with The Blitz and Rationing, when some unexpected guests arrive, and the mood changes! You are invited to join us and travel back in time, experience what they feel and how they cope with their troubles and their surprises. Be part of this special Christmas Celebration ...........you could even come dressed in the 1940s style (but not essential) and add to the atmosphere! The first show Maskers performed was a Shakespeare, Much Ado about Nothing, in which Sheana played Hero. She also played the lead in Alan Ayckbourn's Woman in Mind. Directing plays came later, and most enjoyable of these were Wind in the Willows at Mottisfont and Little Women at the Nuffield Theatre. Sheana and Brian both wanted to try something a little different and challenging for this year's Christmas anthology, so they have collaborated their ideas. As Sheana was in the first ever show, she is a Founder Member, and she can't believe how time has flown! Brian has been a member of Maskers for over 40 years, as an actor, director and general mover and shaker. Directing credits include Absurd Person Singular, The Man in the Iron Mask, Comedy of Errors, The Servant of Two Masters and The Importance of Being Earnest. His most recent acting role was Long John Silver in Treasure Island, a part which he said he would give his right leg to play! 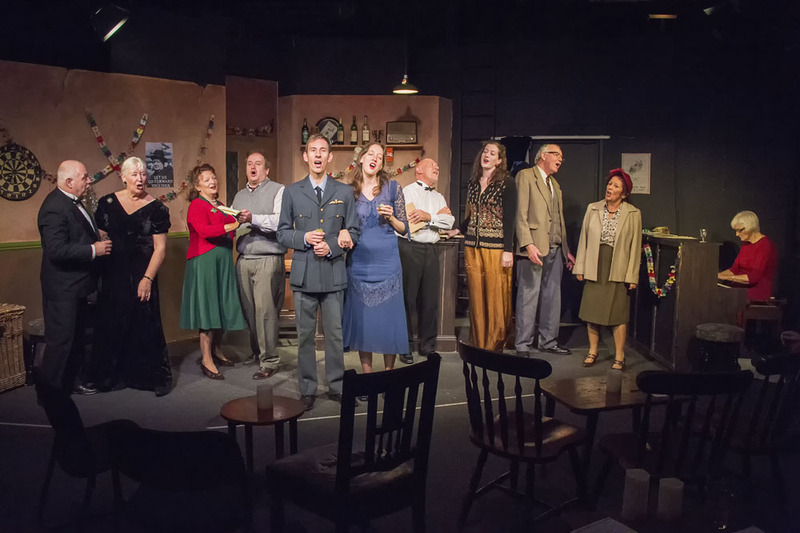 Room at the Inn has been an opportunity to remember and draw upon the stories told by his parents about the Blitz in war time Southampton, but… maybe the best bit was just having the chance to collaborate with Sheana! This is Leah’s sixth show with Maskers over a 12-year membership, playing anything from Anne Boleyn’s faithful friend Lady Celia to a singing strumpet or even controlling puppets deep in the Indian jungle. Leah returns to her singing roots in this role and is looking forward to exploring this character in her first Maskers Christmas show. Being in this show brings back memories from Johnny's first appearance with Maskers aged 10 (you will find out why later). It was 'Oh What a Lovely War' and he still remembers the songs... even the rude bits! Since then, he has been in many productions at venues ranging from the Nuffield Theatre to the open air at Mottisfont. Johnny's most recent acting credit was playing Finbar in 'The Weir'. But perhaps his most rewarding production was writing and directing 'Mitchell's Wings', the story of the Spitfire. Although Peter has occasionally been dragged onto the stage as an actor, his principal involvement with Maskers has been in set design, including Crimes of the Heart, The Graduate, Humble Boy, The Crucible, and Pride and Prejudice. He has also designed productions for Salisbury Playhouse, Motley Crew, Chesil Theatre, Boil & Bubble, and Southampton Operatic Society among others. He and his wife Ros also brought their nostalgia show, Thanks for the Memory, to the Maskers Studio Theatre. 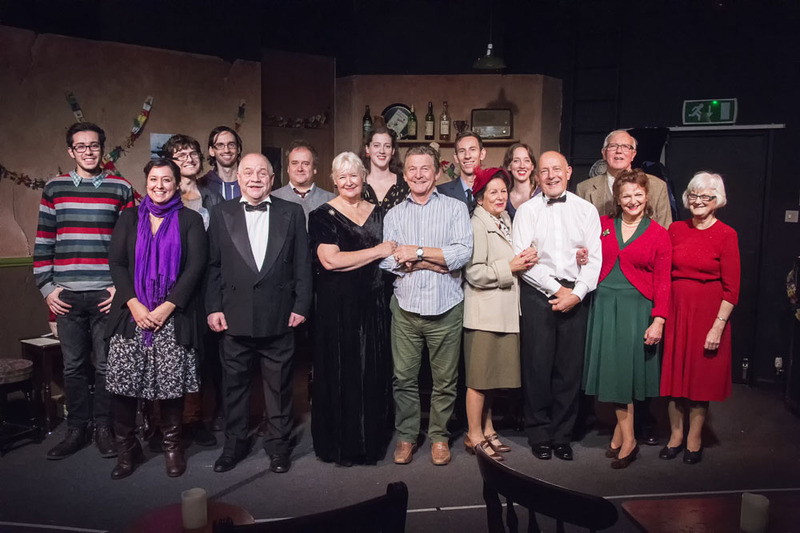 Peter is also heavily involved with the Chesil Theatre in Winchester. Maria has been a member of Maskers for many years and was last seen as Sonia Serebriekova in Brian Friel's 'Afterplay'. She played Marmee in the 2009 production of Little Women and has performed in several open air productions at Mottisfont, including Mistress Page in The Merry Wives of Windsor. She is looking forward to getting into the Christmas spirit in wartime Shirley. Normally at Christmas time, Ruth and her sister Leah are to be found singing soprano in the local church choir. 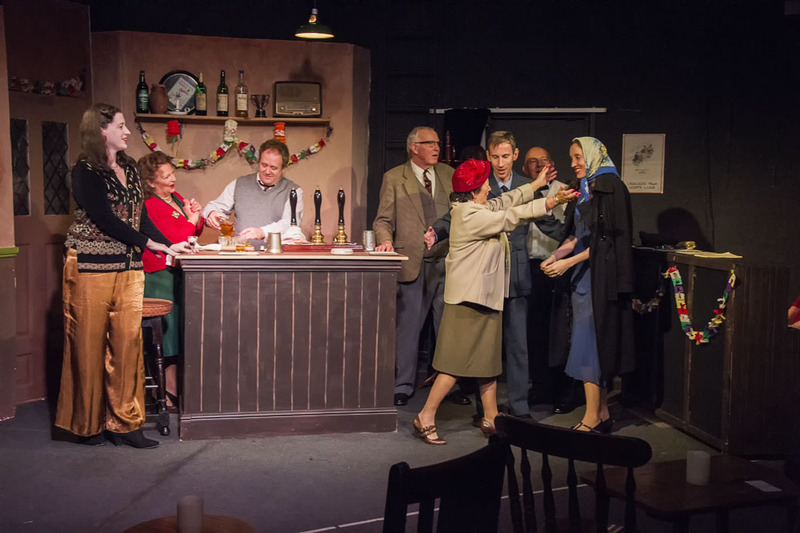 A lover of WWII history and traditional Christmas music, she can't wait to recreate the festive season in a Southampton pub steeped in local memories. Ruth has been singing from an early age, appearing in many musicals in the south before joining Maskers at age 18. Normally wearing her Marketing hat, she's looking forward to donning some vintage clothes this Christmas. Stuart has been acting on and off for 20 years and he has appeared in several Shakespearean plays. Some of his favourite Shakespearean characters are Bottom in A Midsummer Night's Dream and Falstaff in Henry IV Parts 1 and 2. Stuart has been a member of Maskers since November 2013. He appeared as Jerry in The Zoo Story for Maskers in March 2014 and he is looking forward to devising and appearing in Room At The Inn...It should be a lot of fun. This is Jonathan’s fourth Maskers production, having appeared in Pride and Prejudice (2007), Anne Boleyn (2013), and Our Town (2014). Jonathan has also performed at the Nuffield Theatre with Southampton University Players, appearing in a range of plays over the years. This will be his first Maskers Christmas show and he is looking forward to getting into the spirit of the season! 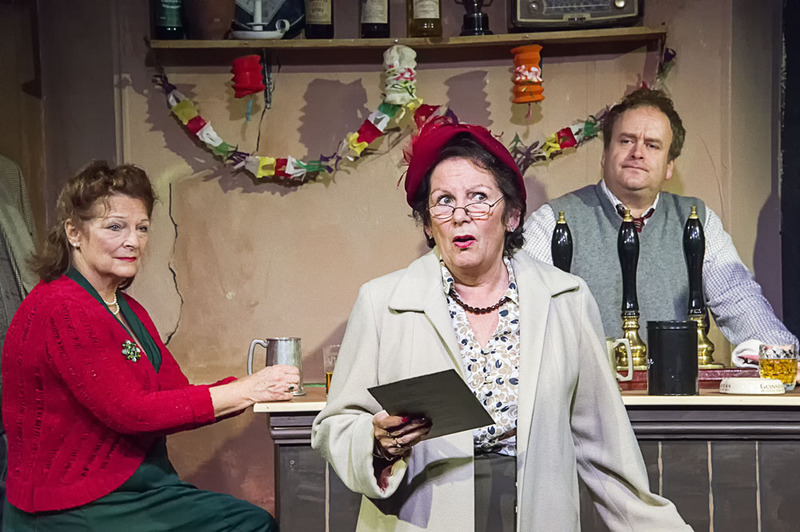 Angela is delighted to be playing the ‘blousy barmaid' Phyllis (based on a real barmaid from the Rover Pub in 1940s Shirley). Over the past 40 years Angela has played many roles at the Maskers Studio, The Nuffield and in the open air summer productions. She is rarely seen without bundles of publicity flyers as she is part of the hardworking marketing team! 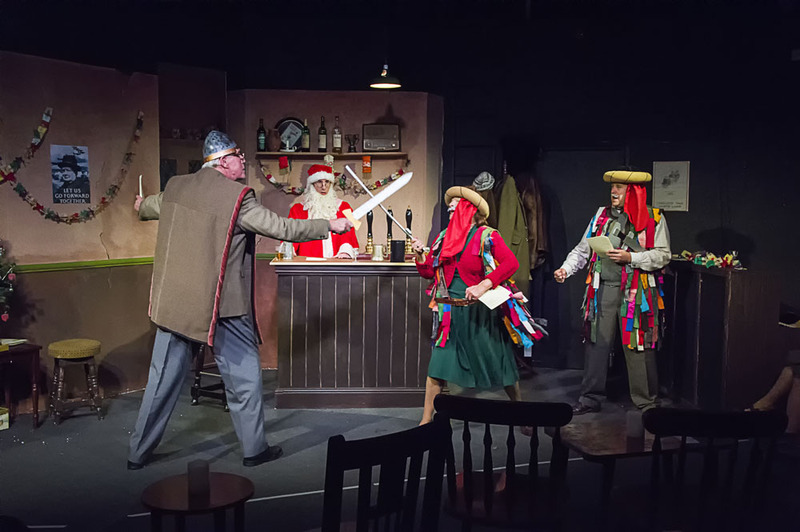 Alan has been a Masker for 40 years and has appeared in productions at the Maskers Studio Theatre, the Nuffield Theatre, the Theatre Royal Winchester, the Tudor Merchant's Hall and in the open air at Mottisfont and Hamptworth. 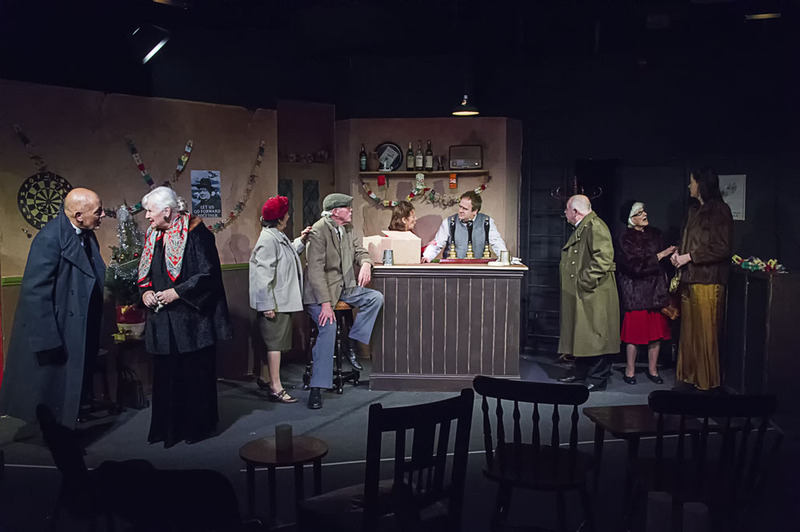 The wartime setting of this current production prompts Alan to pay tribute to his parents' hope in starting a family during the dark days of 1942. 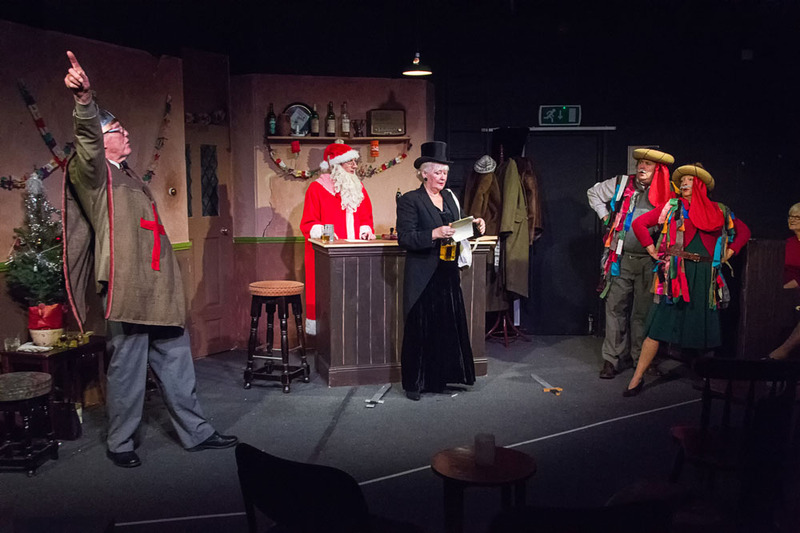 Robert's first ever role with Maskers was as the Stage Manager for the Christmas show in 2011. Since then he has taken on numerous roles both onstage and offstage. 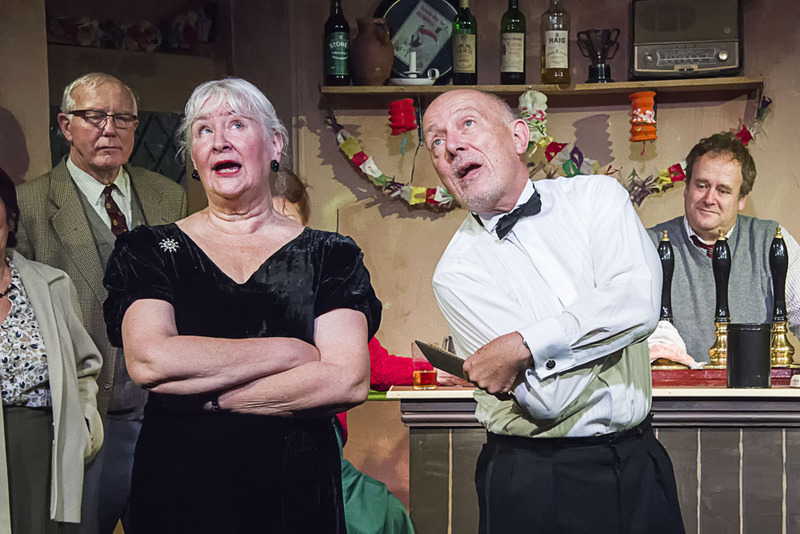 He is happy to return to work on the Christmas show again this year as Assistant Stage Manager and playing the role of the Vicar for one night. He hopes the show conveys the power of Christmas to bring light to even the bleakest periods of time.